Bidens connata.John Hilty.www.illinoiswildflowers.info. (Accessed 5/2014). Bidens connata is an annual herb, 10 cm to 2 m tall, mostly smooth, stem green to purple. Leaves opposite, simple, narrow, to 15 cm long, 4 cm wide, margins coarsely toothed, or larger ones often deeply 3-lobed (rarely 7 lobed), tip long-pointed, base tapered, stalk to 3 cm long, often winged. Flowers dark yellow-orange, heads mostly rayless (or rays to 0.4 cm long), hemisphere-shaped, outer bracts 4-9, narrow, anthers blackish, slightly longer than petal lobes, blooming and fruiting Aug.-Oct.
Bidens connata fruit. By Donald Cameron. Copyright © 2017 Donald Cameron. New England Wild flower Society. gobotany.newenglandwild.org (Accessed 11/017). Fruit dry 1-seeded achenes to 0.6 cm long, 0.3 cm wide, flattish, 4-awned at top, midrib prominent, dispersed by attachment to fur or clothing. Seeds eaten by birds, foliage eaten by rabbits, (possibly muskrats also) (Martin et al. 1951). Habitat: Open, wet areas, soil pH 5.2-7.1 (USDA 2006). 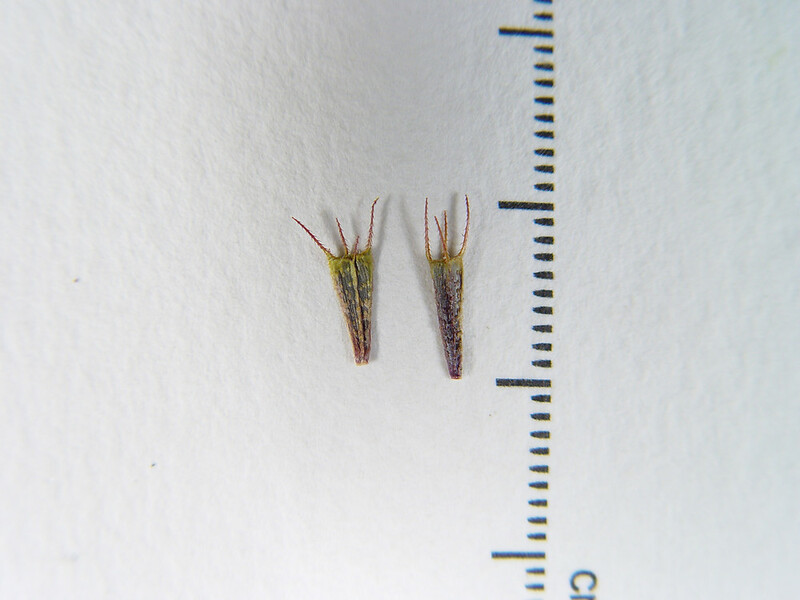 Notes: A very similar, Eurasian, species is B. tripartita (collected in Richmond Co.). It has three-parted leaves more frequently, and achenes are smoother and flatter than B. connata. They are very difficult to differentiate and often lumped together. 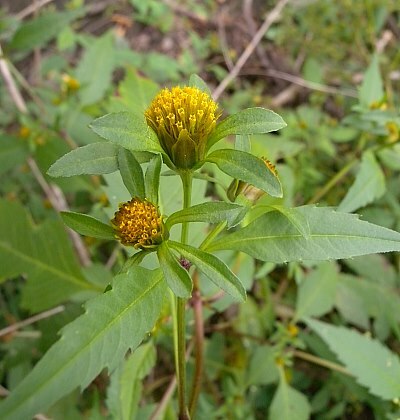 Bidens tripartita is listed as native by the PLANTS database (USDA 2006).